What is Solvit HoundAbout II Aluminum Pet Bicycle Trailer? 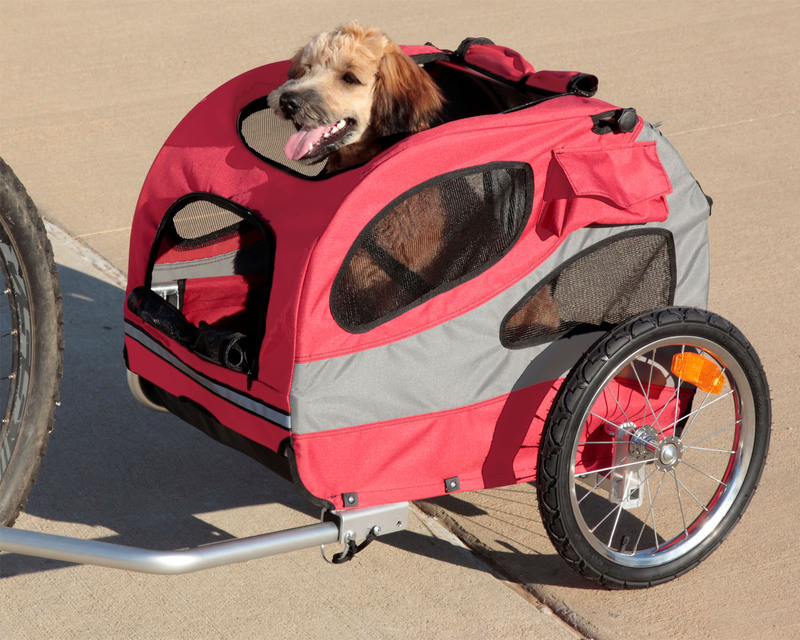 The Solvit HoundAbout II Aluminum Pet Bicycle Trailer is a great way for you to stay active with your pet! Instead of leashing your pet to your bicycle, he or she can safely and comfortably ride behind you. The Solvit HoundAbout II Aluminum Pet Bicycle Trailer has a low center of gravity which provides your pet with a smooth, stable ride. Plus, with the trailer being so low to the ground, your pets can easily get in and out. Available in a medium or large, the Solvit HoundAbout II Aluminum Pet Bicycle Trailer has mesh windows, and a "front door" that your pet can see out of to view his or her surroundings. In addition, it includes a top "sun roof" that allows taller pets to look out of and get some fresh air. The Solvit HoundAbout II Aluminum Pet Bicycle Trailer really is ideal for those that love to be out on the open road with pets, and it also comes with easily accessible pockets to keep keys, treats, water bottle and even leash so you don't have to carry another bag on your travels. 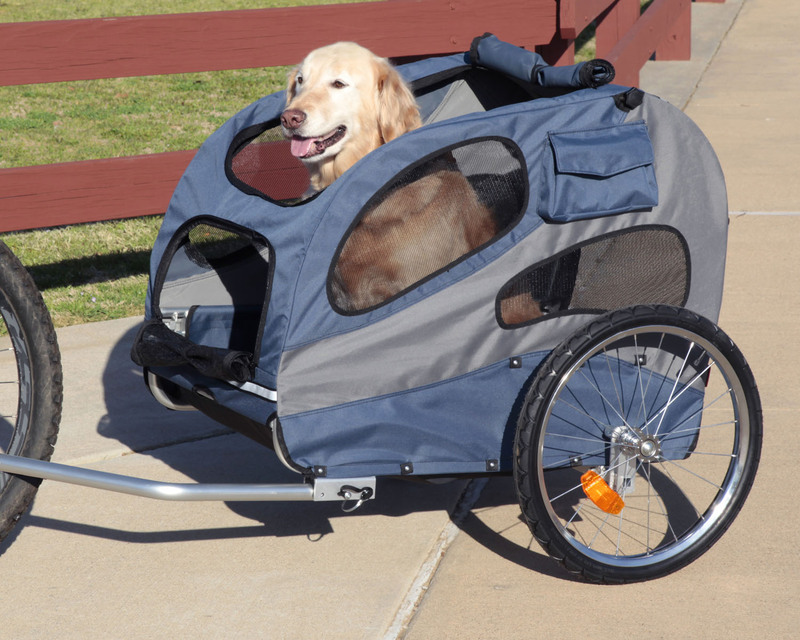 If you are also looking to walk or jog with your pet, convert the Solvit HoundAbout II Aluminum Pet Bicycle Trailer into a walking or jogging stroller with the Solvit HoundAbout II Aluminum Pet Bicycle Trailer Stroller Conversion Kit (sold separately). This kit includes a handlebar, front swiveling wheel, parking brake and cupholder. Easy to set up and use, the HoundAbout II Aluminum Strolling Kit can be used for walking paths as well as off road conditions (though not for extremely rough terrain). NOTE: The Solvit HoundAbout II Aluminum Pet Bicycle Trailer Stroller Conversion Kit is also available in Medium and Large sizes to match the trailers, sold separately. The Solvit HoundAbout II Aluminum Pet Bicycle Trailer assembles easily by attaching a bicycle hitch and tow arm right to your bicycle's back tire. With a wide base and low center of gravity, the Solvit HoundAbout II Aluminum Pet Bicycle Trailer provides you and your pet with a smooth, stable ride. The top (sun roof) and front come with zippered doors that allow your pet to see out clearly and get fresh air. The Solvit HoundAbout II Aluminum Pet Bicycle Trailer comes with a padded liner so your pet is comfortable the whole way of your journey. The Solvit HoundAbout II Aluminum Pet Bicycle Trailer comes in Medium, which holds pets up to 50 lbs, and Large, which holds pets up to 110 lbs. Convert the Solvit HoundAbout II Aluminum Pet Bicycle Trailer easily with the HoundAbout II Aluminum Strolling Kit (sold separately). The kit comes with a front wheel, handlebars, parking brakes and cup-holder. Solvit HoundAbout II Aluminum Pet Bicycle Trailer: For full instructions see the Solvit HoundAbout II Aluminum Pet Bicycle Trailer Instruction Guide. 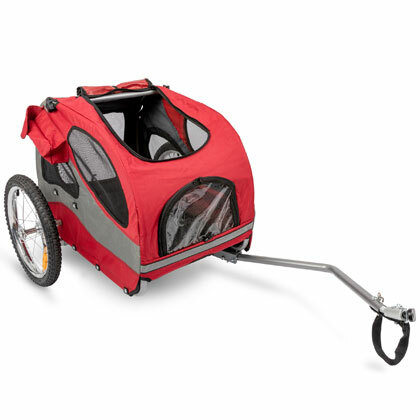 The Solvit HoundAbout II Aluminum Pet Bicycle Trailer is great for senior pets that love the outdoors but don't have the stamina for long journeys. Solvit HoundAbout II Aluminum Pet Bicycle Trailer Stroller Conversion Kitis also available in Medium and Large sizes to match the trailers.